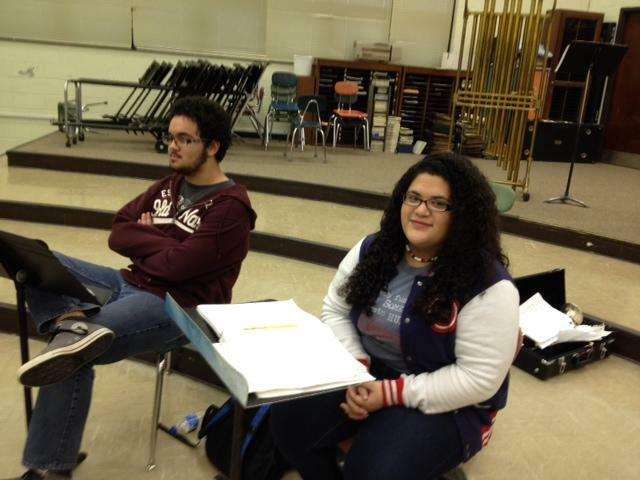 Thomasville sophomore Denise Dominguez takes AP music theory, one of the hardest AP classes. Jess Clark reports on a rural school district's plan to give more students access to AP classes. Thomasville High School sophomore Denise Dominguez takes one of the hardest AP courses there is—AP music theory. She’s following along from the top riser in the band room, as her teacher runs through some of the finer points of choral music composition. Just half of the students who signed up for this class in the fall are still taking it in the spring. But if you knew Dominguez’s history, you might not expect her to be one of the ten students sticking with it. At the end of last spring, Dominguez wasn’t even in school. She had dropped out. "I suffer from mild insomnia," Dominguez explained. "It affected me really bad during school, and I wasn’t coming on time. And then truancy court kind of got involved. And my mom got scared so she took me out." Thomasville City School officials reached out to Dominguez’s family, and she re-enrolled in August. They set her up with a mentor, Thomasville’s accountability director Crystal Clodfelter. Clodfelter says students like Dominguez would miss out on the chance to try college-level coursework if the district only looked for honor-roll students to fill their AP classes. Dominguez’s band director encouraged her to take the AP class, even though she dropped out last year. And Clodfelter says she often pulls students’ state test scores back to third grade, looking for potential that may not be apparent in their most recent grades. "Sometimes students in middle school, and even ninth grade, will take a dip in their grades," Clodfelter said. "And if that’s all we look at when we determine their placement in these honors or AP courses, we miss students." Dominguez says her AP music theory class is tough, but she plans to be ready for the exam. "I hope I can pass it," she said. "So far, I’ve passed most of my tests." Dominguez is one of many students at Thomasville who are taking an AP class for the first time this year. Between 2013 and 2015, the number of Thomasville seniors taking AP tests went from less than 9 percent to more than 30 percent. Participation rates in AP exams among high school seniors. Last school year, the district made a big push to increase access to AP courses. Thomasville City Schools Superintendent Maria Pitre-Martin says the district is hoping that tripling the AP course offering will not only provide opportunities to re-engage students like Dominguez, but also help keep high-achieving students in the district. In recent years, she said, the district has been losing many of its most driven students to the school system in the surrounding county, which offered far more AP programming. "Many of them were leaving who were more advanced students looking for more rigorous coursework," Pitre-Martin said. Thomasville City Schools got funding from the College Board, which creates AP programming, to train new AP teachers. The College Board has partnered with about 20 other districts around the state to provide similar support. Pitre-Martin says expanding AP classes could have a big impact on college access in her district, where 93 percent of students come from low-income families. "Many of our students cannot afford four years of college. So if you can leave us with 30 hours toward your degree, that saves a lot of money," she said. Of course, to earn credit towards a degree, students have to pass their AP-exams. And, the number of Thomasville seniors passing their AP exams is still less than 10 percent. Pitre-Martin says Thomasville is trying to move the dial on the pass rate. "I think sometimes there’s a misperception that because we have high-achievers or students who have done well on state tests, they don’t need the additional support," she said. The superintendent is considering adding a study hall or extra class for AP students—many of whom, she says, don’t have the internet access they need at home to study or complete their work. But Pitre-Martin says even if a student doesn’t pass the AP exam, the experience of college-level work is worth it. "You may not get the A or B that you’re accustomed to in the regular classes, but you will be a better prepared student to walk into the university," she said. Thomasville City Schools isn’t the only district ramping up its AP courses. Districts across the state saw a nearly 20 percent increase in the number of AP exam-takers last school-year. That increase came after lawmakers set aside funding in to cover the AP exam fees for every high school student in the 2014-2015 school year. Exam fees are covered again for the 2015-2016 school year. Some teachers and schools administrators say one of the biggest obstacles to success for public school students in rural communities is poverty. And research shows if you are poor, you have a good chance of being overlooked for gifted, honors or advanced classes. In our series, Perils & Promise: Educating North Carolina’s Rural Students, we spoke with students in an Advanced Placement class in Vance County about their path to success.